Inspired by a Gypsy jazz style invented in the 1930&apos;s by guitarist Django Reinhardt and the Hot Club of France, Mango fan Django&apos;s sound also sends a wink and a nod to jump swing hepcats of the 40&apos;s, the sassy Caribbean and Latin bands of the 50&apos;s, 60&apos;s and beyond, and contemporary musicians from today&apos;s Gypsy jazz scene. 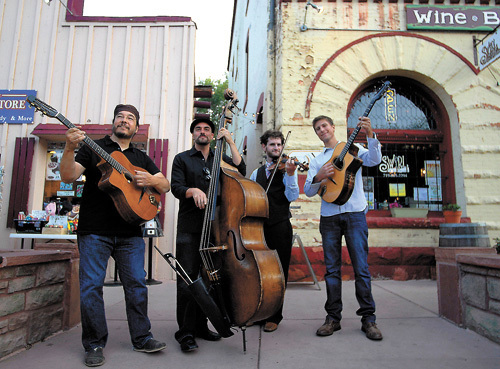 Mango fan Django is available for private engagements and gigs at your event, business, bar, or restaurant throughout Colorado and New Mexico. "What song is that? Which CD can I find it on?" We get these questions a lot. We thought it was time to provide the answer! Mango fan Django&apos;s new CD Indigo Dreams contains nearly 1 hour of music with 13 songs -- among our most-requested numbers at gigs! The result is a very listenable and yet varied collection of songs from Gypsy Jazz and American Swing to original material all done in the unique Mango fan Django style. This CD sounds like a live Mango fan Django trio show with a couple of surprise guests (David Seigel, violin; Jeff Sutton, trumpet) joining the fun!